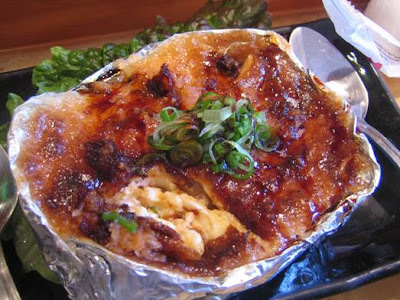 I've had a conflicted relationship with Ango-tei in Costa Mesa. When I first visited about a dozen years ago, I really enjoyed the food and the intimate, mom-and-pop ambience. But over the years, other Japanese places diverted my attention, and Ango-tei was slowly forgotten. When I did visit again about five years ago, the food was good, but not memorable. 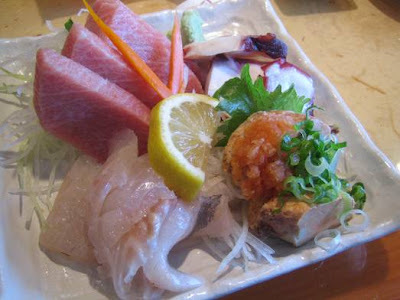 Earlier this week, I gave Ango-tei another chance when foodie-friend Lisa and I were jonesing for sushi lunch. I had passed by Ango-tei in recent weeks, and it made me think: I want to give it another try. Because Ango-tei has all the elements to be a kickass sushi place: small and intimate (antithesis of the trendy rock-n-roll sushi places); Japanese-owned; in business for more than 20 years (though ownership changed a couple of years ago). Lisa and I got there right at high noon, were seated at the nearly empty sushi bar, and ordered omakase. 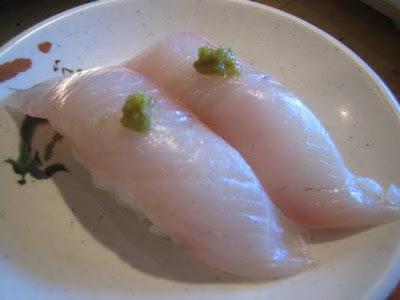 We were immediately taken aback by the large and chunky slices of fish, not deftly cut into graceful, slender pieces. But the colors and textures looked good, so we moved past the visual sloppiness and dug in. The toro was buttery and nice, though I couldn't stop thinking that the large slices looked like Spam! The octopus was tender and flavorful - clearly high quality, but mistreated by being cut in chunks. The monkfish liver was silky-creamy, like tofu, with a nice, very subtle flavor of the sea. It was served in the traditional way: steamed, sliced into sashimi and garnished with scallions and grated daikon flavored with a dash of red pepper sauce and ponzu. 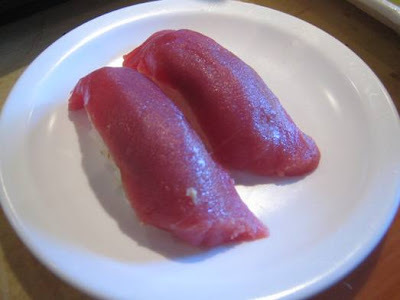 A note on monkfish liver: it's such a popular Japanese delicacy that there have been concerns about its sustainability and fishing methods. It's listed on the Monterey Bay Aquarium's Seafood Watch as a fish to avoid. The snapper was nice, but I've been spoiled by the exquisite version at Shibucho. The Ango-tei tai was good, not great. Not something I'd order, as you regular RawFishionado readers know. It was similar to a good macaroni and cheese: crunchy on top, creamy inside (the Japanese love making stuff with mayo; they fancy themselves European in taste), and there were plenty of slices of clam inside. Comfortingly good, but after a couple of bites, I was done. 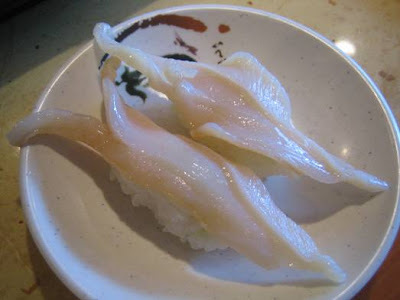 Mirugai (giant clam): Tasty, with a nice mild taste, and a slight crunch in texture. Kanpachi (of the yellowtail clan): Light, refreshing, with the yuzu packing a pleasantly stronger spice punch than expected. My favorite of the meal. 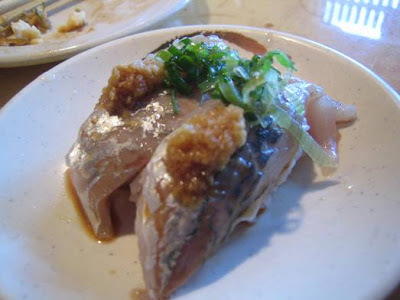 Aji (Spanish mackerel): Unfortunately, the chef was a bit heavy-handed with the ponzu sauce. But I mustered up my deepest taste buds to seek the flavor of the fish, and actually succeeded - the mackerel itself was lovely, very mild and fresh-tasting. The bill for this omakase was $50 each - overpriced for what we got. I'd rate Ango-tei's sushi 3 stars: reliable, but not extraordinary. It's not a strong competitor in the sushi arena, especially when there are heavy hitters within a 5-mile radius: Ikko, Shibucho, Murasaki among them.